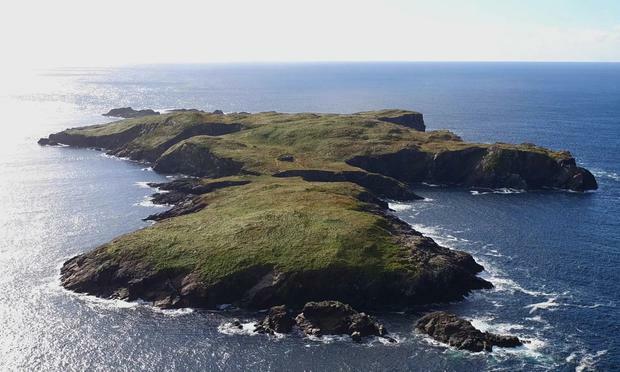 If you have a million euro or so to spare, a small Connemara island might be of interest as a bolt-hole. On the other hand, if you are a serious birder, seal-watcher, or all-round conservationist, it would be a unique sanctuary with peaceful monastic ruins - including a 7th Century beehive structure, and the remains of an old mining hut which could become a dwelling. There are 80 acres of thinly soiled land with no sounds but the sea and curious bird calls in the night at certain times of the year from the depths of old burrows. The poet, the late Richard Murphy, heard some different bird sounds when he bought High Island from a man who had been grazing sheep there. Murphy became enthused with the idea of restoring the early Christian beehive cells and oratory of the derelict hermitage. He spent time trowelling the hermitical footsteps of Saints Fechin and Gormgal, cleaned out a well sacred to the memory of Brian Borumha - the water was said to have turned red after the Battle of Clontarf - and subsequently arranged for Mass at the roofless oratory for visiting pilgrims. Murphy camped out alone and recalled the sounds of the seals and birds. He claimed to have been writing in the dark, alerted to the whispering of wings overhead and sounds of vibrating, mewing and purring from migrating storm petrels (Hydrobates pelagicus) deep in burrow nests. From this came the poem Stormpetrel about a bird he described as a gypsy of the sea; "you flit in a sooty grey coat smelling of must". In the skull of a hermit, he claimed to have found a nest of this bird of nightly murmurings, "a pulse of the rock/ You throb till daybreak… a song older than fossils/ Ephemeral as thrift..."
Storm petrels are small, like sand martins, tube-nosed and with disproportionately large rounded wings on which they pass most of their lives skimming the surface of the sea, often following ships. Connemara folk have given this bird the distinctive name, Peadarin-na-stoirme - and having ranged over oceans during autumn and winter, Little Peter returns to nest here and to islands off Wales and Scotland, Iceland, the Faroes and Norway. One egg is laid, incubated by both parents, hatched after 40 days, the youngster leaving the nest for an independent life after 60 days. About 160,000 pairs spend noisy nights in burrows and crevices with smaller numbers going south to Madeira and the Canaries. By the way, if you are interested, I am told that the present owner of High Island is Feichin Mulkerrin and that the agents for the property are Spencer Auctioneers. Joe Kennedy The Easter Bunny is really a hare. Fluffy rabbits appeared when some Madison Avenue whiz decided they would be more cuddlesome than a lanky, bony grass skimmer - though I once had a toy hare, poised on wire-framed legs back in the last century.